Ann Derrick and Brendan Burrows created and opened Glen Arbor Botanicals in 2001. The gallery is a culmination of Ann’s personal passion for antique art, and her life long collection of natural history illustrations. 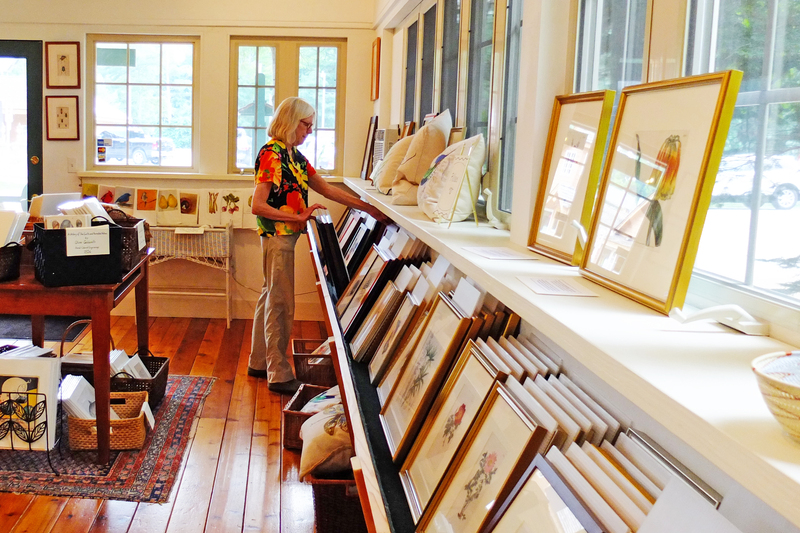 Ann combines her background in art history and her professional experience in the art business in the Detroit area to bring an exclusive selection of fine collectables to Glen Arbor. The gallery began with antique botanical prints as the main emphasis from European publications dating from the late 1700s. All botanicals are original, not reproductions, and are hand colored engravings or lithographs.Over time, Ann has extended her collections to include birds, butterflies, insects, antique garden designs, food prints, and other collectable genre. Original Audubon lithographs, Denton’s well-known fish illustrations, and an extensive collection of plates from Curtis’s Botanical Magazine feature local and favorite wild flowers. Glen Arbor Botanicals also features limited editions of Japanese woodblock prints. Well know artists such as Hajime Namiki, Fumio Fujita, and Masao Ido are included. Ann selects pieces in keeping with the general theme of the gallery; forests of birch and pine reflecting our own northern Michigan woods, cherry blossoms and maple tree prints depicted in rich tones provide classic examples of the Japanese mastery of elegant simplicity and composition. Glen Arbor Botanicals frames all pieces with museum quality materials, conservation matt board, and UV filtering glass so that your art will be protected for years to come. We are happy to accommodate your taste in framing or arrange a group with matching frames. Designed and built by Brendan, the gallery building itself incorporates two red pine trees growing through the roof. The space is light and airy with a cottage feel; complete with a spot to sit and read.We invite you to visit and enjoy our collections from May through October.Collectors with questions or special requests can contact Ann anytime via email.